Years before he became His Holiness the 14th Dalai Lama, the man then known as Tenzin Gyatso was born on 6 July 1935 to an agricultural family, in a little hamlet situated in Taktser, Amdo, north-eastern Tibet. At the age of two he was recognized as the reincarnation of his predecessor the 13th Dalai Lama. The Dalai Lamas are believed to be manifestations of the Bodhisattva of Compassion, who chose to reincarnate to serve the people. Dalai Lama means Ocean of Wisdom. Tibetans in general refer to His Holiness as Yeshin Norbu, the Wish-fulfilling Gem, or simply, Kundun, meaning The Presence. 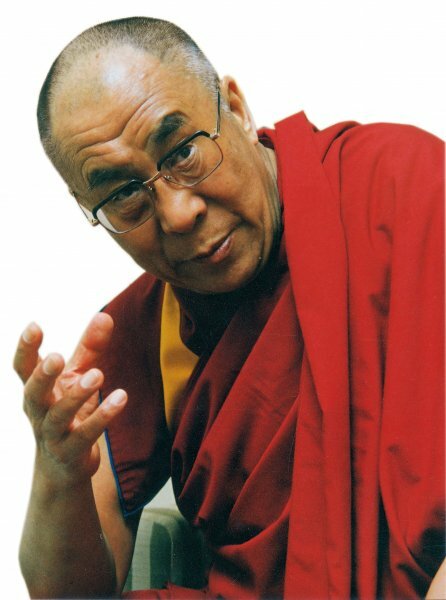 When describing himself The Dalai Lama says: “[I am] merely a simple Buddhist monk and the spiritual leader of Tibet”. In 1989, he was awarded the Nobel Peace Prize. He also became the first Nobel Laureate recognized for his concern for global environmental problems. The Dalai Lama has travelled to more than 62 countries across 6 continents. He has met with Prime Ministers, Presidents and crowned rulers of major nations and has held dialogues with the heads of various religions and many well-known scientists. Since 1959, His Holiness has received over 84 awards, honorary doctorates and prizes in recognition of his message of peace, inter-religious understanding, universal responsibility, non-violence and compassion. His Holiness is also the author of more than 72 books. Six million Tibetan Buddhists look to him for religious guidance but he was also leader of 100,000 Tibetans living in exile in India and the world's most prominent political refugee. Since fleeing Tibet he has devoted himself to campaigning internationally for his exiled homeland, but always emphasizing the need for non-violence – a stance which won him the Nobel Peace Prize in 1989. On 14 March 2011 His Holiness sent a letter to the Assembly of Tibetan People's Deputies (Tibetan Parliament in exile) requesting them to devolve him of his temporal (political) power. According to The Charter of the Tibetans in Exile, His Holiness was in principle still considered to be the head of State. This momentous proclamation brought an end to the dual spiritual and political authority of the Dalai Lama and reverted to the prior tradition of the first four Dalai Lamas being only the spiritual leader of Tibet. The democratically chosen leadership would assume complete formal political leadership of Tibet. On 29 May 2011 His Holiness signed into law the formal transfer of his temporal power to the democratically elected leader. This brought to an end the 368-year old tradition of the Dalai Lamas being both spiritual and temporal head of Tibet. For His Holiness birthday celebrations there will be prayer ceremonies around the world and other activities organized by the Tibetan people. On this occasion UNPO joins hundreds of thousands of Tibetans in wishing His Holiness a long and successful life.